Hello polystyrene my old friend. Wouldn’t take long before I came back for this versatile material. Creating with polystyrene is quite messy. It’s also a bit unforgiving, as exposing its characteristic structure easily breaks the immersion. The basic foundation has been set. So I went for a bit more expensive polystyrene; not having to deal with the crumbles of the standard package-type was quite the relief. Above is the result of a few hours of carving in the couch for a few evenings. I started of with a wire cutter for the basic shape, moved on to a standard carving-knife and finished off with a carpet-knife. It ended up three levels high, using sticks and PVA to fixate. As I’m still playing around and getting comfortable with creating terrain, I went for the middle ground in terms of dedication to this project. I used putty and and rocks to cover gaps between the layers and trying to reduce the fact there is obviously three distinct layers (four with the last part placed on top). Bellan progress pictures 101: Draw the ring. 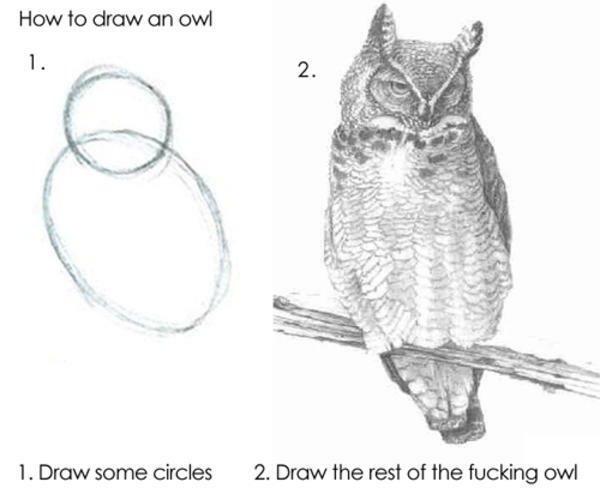 Then the rest of the owl. After making sure the putty is fully dried – slab on the paint. I bought generous quantities of paint when I worked on the game-board so i could add it to my terrain. The result is OK. The layers are still obvious, which is a good thing to note for future cliffs. I’m satisfied with the carving, though I will work more to create more transitioning between layers. Didn’t take long before I moved on to a second one.